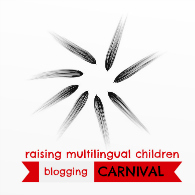 As host of the November edition of the Raising Multilingual Children Blogging Carnival, I wanted to pay tribute to the upcoming US holiday of Thanksgiving. Yes, even though I'm feeling rather resentful of this warm and fuzzy celebration, given my father's recent passing ("gratitude" is not the first emotion to come to mind this season). But it seems that connecting with other parents all over the world who are also raising their children with more than one language and finding out what they are most thankful for in this process has helped--I see that we have much in common, that we all persevere, that we will all be thrilled one day down the road when our children tell us "Thank you for making it possible for me to become multilingual." So I asked you all what you are grateful for on these journeys--your supportive spouse? your library card? your frequent flyer miles? And the results are in! I think they'll resonate with you as much as they do with me. Family: Unsurprisingly, the most popular answer. We cherish our parents' and our spouses' support, even if they don't speak the language we are imparting to our children! Strongly connected to this answer are several writers' mentions of their families' cultural heritage as well as a discussion of how multilingualism shapes the family's identity. Education: The second most common answer. We praise our teachers, our schools, our children's schools, our children's afterschool enrichment programs. Our children's attitudes: The fourth most cited answer. We delight in our kiddos' interest in and willingness to speak the minority language(s), describing it with phrases like "zest for learning" and "contagious enthusiasm." Community: We so appreciate what our circles of friends, our communities (next door and online), and our cities offer to multilingual families. Travel and the Internet: Interestingly, these two nearly-polar-opposite ideas received an equal number of mentions in our essays! Some of us treasure our opportunities to travel to countries where our families' minority language is spoken; some of us treasure the Internet, which brings those other countries into our homes. Everything else: One or two writers also cited the following ideas: watching videos in the target language; the way that multilingualism has sculpted self-identity and created a sense of family identity; and appreciation for the way that others react to a multilingual family. Intrigued? Now go take a look at all of the essays to read more about the writers' explanations of their choices! Bilingualism and Multilingualism in Parenting and Teaching: Eugenia describes an "all-day family pyjama party" and her children's ability to switch in and out of languages with ease, concluding with "the language we all stuck to today, understood perfectly and loved using no matter who we were with was the language of happiness. My favourite of them all!" Bilinguebabies: Audrey praises her "very patient monolingual husband and father," her oldest child's willingness to speak Spanish to his siblings, their books, the opportunities for her family in London, and "the joy of hearing and seeing the benefits [of bilingualism] in my children." Bringing up Baby Bilingual: I share my appreciation for my education, my family, the Internet, and my community of Francophones, Francophiles, teacher colleagues, fellow bloggers, the public library, and my son's bilingual (Spanish-English) elementary school, explaining that indeed, to raise children with more than one language, "it takes un village." Busy as a Bee in Paris: Maria enumerates 30(!) things that she's thankful for, especially her "four beautiful children who are each embracing their multilingualism and multiculturalism with their whole hearts." She also explains that sharing three languages (English, Spanish, and French) "makes our family so united and so unique and gives us a common goal and identity and purpose!" 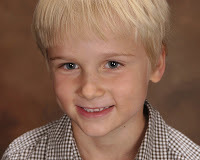 Discovering the World Through My Son's Eyes: Frances freely admits that raising her son bilingually has been challenging, but now that she is successfully teaching him to read in Spanish, her "worries instantly subsided with his reaction....his excitement to learn a new language." She is grateful for his motivation, which in returns motivates her! A French American Life: Carol shares her many reasons for gratitude, from education to bookstores to her children's attitudes. Being the maman of a bilingual, bicultural family has broadened her horizons and improved her outlook: "I'm a better, more tolerant, more open-minded, more patient, and I think more interesting person after learning how different languages, cultures, and families can be." Intentional Mama: Michele meditates on grace and gratitude as a mother, world citizen, and writer, citing in particular Les Petits Livres, a French children's books rental-by-mail service, as a wonderful resource. She adds, "I'm grateful for the time I've been able to spend living and traveling in other countries. From Sri Lanka to Syria, the people I've met have added so much to my understanding of human nature, and I feel fortunate for these experiences and how they've changed my global perspective." Mommy Speaks Chinese: Emy focuses on the education: her quest to find an extracurricular Chinese language program for her two children with an emphasis on speaking and interacting, unlike the stiff, serious, writing-intensive Saturday Chinese school that so many Chinese-American children of her generation attended. "I was really happy to find an after school Chinese immersion program just two miles from my house! It was a brand new facility, with bright cheerful classrooms, sweet smiling teachers and (most importantly) small class sizes. Lessons included hands on cooking and crafts." 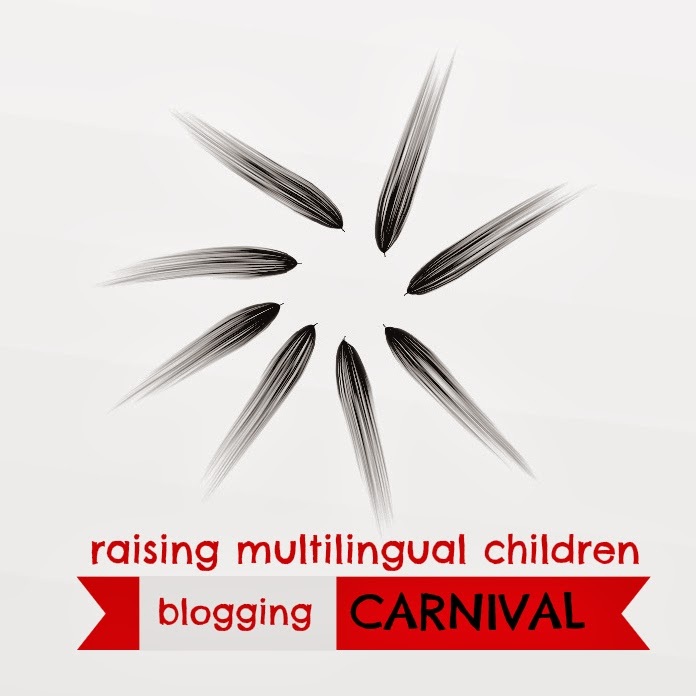 Multilingual Parenting: Rita lists her top 20 reasons that she is glad to be bilingual, including several ideas that no one else mentioned: "I have had the opportunity to read great literature in the language it was originally written in" and "When I was young I had pen pals (with pen and paper via snail mail!) in several countries all over the world." Moreover, she points out, "I can now help other families bring up their children to become bilingual." Open Hearts, Open Minds: As a non-native speaker of Spanish, Lynn is most thankful for WordReference.com ("with the increasingly complex definitions my four-year-old is demanding, I'd have a hard time getting through the day without my favorite iPhone app"); her son's Spanish immersion preschool ("having teachers from various Spanish-speaking countries gives him the kind of exposure that it's hard for just me to provide"); and her monolingual husband who brags about his bilingual son. The Piri-Piri Lexicon: Annabelle realizes that she is lucky for quite a few elements of her multilingual life, from the American Library in their German city to Apple TV to her parents' and in-laws' support ("never questioning our decision to raise LJ with four languages, trusting us, supporting us and helping LJ to practice her languages. I probably would have disowned them anyway if they had raised any objections!). She concludes with a lovely tribute to her amazing daughter who is "perfectly happy, not at all confused, silent or dumbed down by having four languages...by 14 months." Project Procrastinot: Mercedes agrees that job prospects and test scores and lower risk of dementia are all important benefits of raising one's children bilingually. But more essentially, as "professional nomads, living thousands of miles away from family, we don't need a language barrier to divide us even further....Speaking Spanish will be a way for Astro and Cupcake to 'belong' with their family in Venezuela, and to honor our Mexican heritage as well." And now, please share what elements of being in a multilingual family that you are most grateful for! What makes you nod your head vigorously in agreement? What did we leave out? Happy Thanksgiving, dear readers. Give big hugs to your family. I'm grateful for a wonderful wife, who does so much for me and our kids. 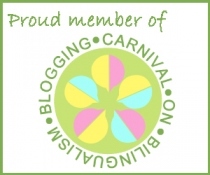 Sarah, I like the positive theme of this month's blog carnival. I tend to focus on the hardships we face as a family from two countries and all the things that I miss every day and it was uplifting and wholesome for me to read about what other parents are grateful for and to think about what I am grateful for in turn. I'd have to say it's my spouse, too! I love his attitude and dedication to this aspect of our family life. We live in his home country, but together we've managed to create a little bubble of my own country around ourselves. He's totally adopted my language, culture and extended family. He worked very hard, read mountains of books, and went from "I took English in high school. Hated it. Can't speak it." to a total bilingual within a few years of meeting me. When we were on the point of getting married he asked me to switch permanently to English with him and it has become our family language. He speaks only English with our three children. He very cheerfully tolerates loooong summer visits with his in-laws. What I admire most of all is his lack of ego in this whole affair. It takes humility to start from scratch, linguistically (and culturally) speaking, as an adult. And he is relaxed and confident that our kids will work out their own identities, whereas I, born monolingual, worry constantly about things like how many hours of each language they're hearing per day and what their emotional connection will be to each, and I have trouble letting go of my yearning for my offspring to be like me, to grow up with the same references I had, to be nostalgic for the same things. Welcome to Bringing up Baby Bilingual! 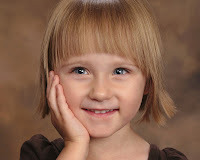 Since 2006, I have used this blog to explore raising children with more than one language and to reflect on my efforts to teach French as a non-native speaker to the enfants in my life--my son Griffin (8 years old), my daughter Gwyneth (4), my nephew Carl (10), my niece Eleanor (5), plus a few young students every year. On this blog, you'll find profiles of bilingual and multilingual familles, resource recommendations, storytime suggestions, book reviews, discussions, descriptions of games and language learning activities, and--of course--stories about our petits bouts de choux. Thank you for visiting my little corner of the internet. Please share your stories, too--I love hearing about other families' journeys in language learning! Bibliophile, builder, soccer player, freestyle dancer, negotiator, never walks when he could run, does math for fun. Kind, compassionate, enthusiastic, creative. Quote: "If I had a superpower, it would be to never forget anything I read." Sweet and sassy shrieker, snuggler, bibliophile, organizer. No longer a "three-nager," thank goodness! Imperious, affectionate, stubborn, clever, whiny. Quote: "Let it gooooooo!" I'm a former French teacher who now tutors, reads, writes, procrastinates, and coordinates an enrichment program called Reading Buddies at the public library. I appreciate whimsy and good books and great cheese. And I'm a "maman"--my son Griffin was born in January 2008 and I speak exclusively French with him and his baby sister, Gwyneth (July 2011), just as I did with my nephew. So you want to start a second-language story time? What's the story behind this blog? Why learn a second language as a child? Is London too expensive for a family day out? Tired of reading about languages?